For some reason this time of year always ends me scurrying for the kitchen, and I'm like a squirrel looking forward to winter. 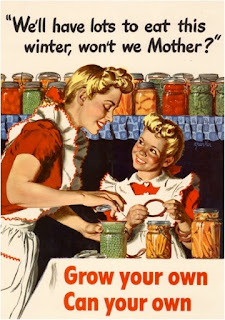 I feel the need to stock up, cook, can, freeze... get ready for winter. I also love taking trips to farm markets for produce and pioneer villages for inspiration. I feel a yen for the past that's puzzling, in some ways. I mean, our life is so easy compared to that of our ancestors. I'm not sure I'm really suited to living as the pioneers did - their struggles seemed, at times, insurmountable - but there is a time in more recent history that calls to me. Oddly enough, it's the Great Depression. It was a terrible time in history for American and Canadian citizens, but there are things I can say were positive, too. As often happens, hard times make people pull together. 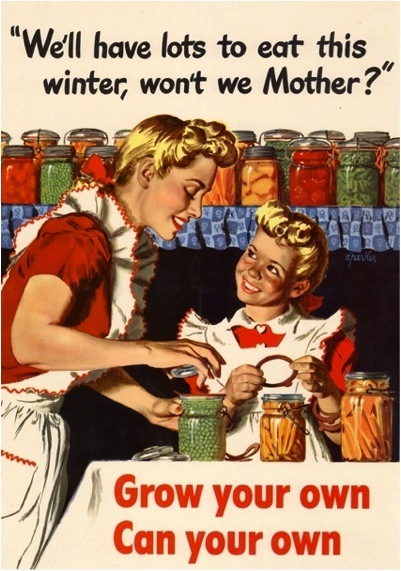 My grandmother was young during the depression, and tells me tales about all the women in her neighborhood gathering for long canning sessions, when they would take advantage of harvest bounty to put up tomatoes and green beans, apples, and other fruits and vegetables, which they would turn into jams, preserves, chili sauce and pickles. Nothing was wasted and much was shared. She says their family would barter. Her mother would sew, or look after children, or do whatever needed doing, and her father would fix things for folks, or do extra work on local farms, all in exchange for produce and eggs, butter, hams. That way even though they were town folks, they made it through hard winters with little money. It wasn't easy, but their spirits and strength were tested and honed by a difficult life. So... this is one of my favorite questions to ask at parties or among strangers; if you had to live in any time in history, when would it be, and why? 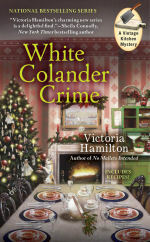 November 3rd White Colander Crime will be released. Next month, on my day here at Killer Characters, October 21st. I'll be doing a HUGE giveaway, with more than one prize. Don't worry; I'll be FBing, Tweeting and Pinteresting the day and the giveaway! 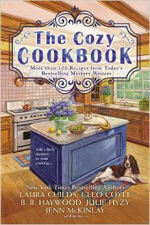 So... NEXT Month, I'll be giving away a copy of The Cozy Cookbook, A complete set of audio CDs of the first three Vintage Kitchen Mysteries, and more! INCLUDING a limited edition White Colander Crime 'Cozy up to a good mystery!' book tote. But... you can pre-order White Colander Crime now! 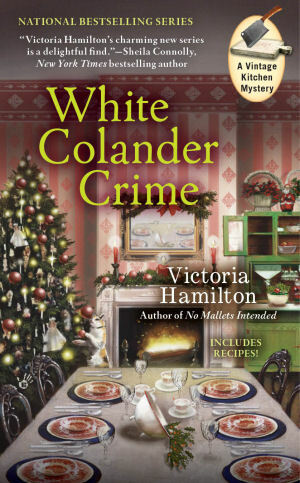 Note: I WILL be giving away copies of White Colander Crime, as well, on my October 21st Killer Characters blog day, BUT... if you pre-order and then win a prize package with White Colander Crime included, I'm always happy to substitute another of my titles instead! You can find me on the web, Facebook, Twitter and Pinterest! I'd want to stick to the present so I could sew and embroider with today's fabulous machines. I wouldn't mind going to sleep and waking up back in the 60's as long as I had the memories of what my life could be like if I redid the things I did the first time, or doing certain things differently to change the outcome. I'd also love to remember all the companies that made it big and buy into the IPO's as they came out. Yes I'm greedy in the sense that I'd like to have a better life the second time around. I would have to say the 1920's. I can totally picture myself as a "bright young thing".